Some of God’s choicest saints were reluctant (like Moses), rebellious (like Jonah), and fearful (like Timothy). 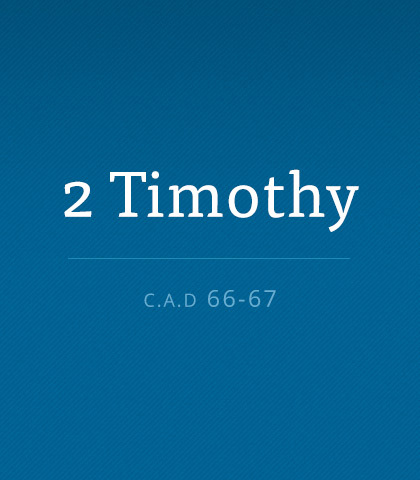 Despite his timidity, Timothy was called to follow God onto the battleground. To do so, the young man needed courage to stand for Christ, even if it meant suffering. Every verse in 2 Timothy echoes this everlasting truth: “All that is not eternal is eternally out of date”—including the last six verses of chapter 1. In these verses, Paul reminded Timothy (and us) that only two things are really eternal and worthy of lifelong investment. If your faith is stagnant, spiritual disciplines can help you return to a deeper relationship with Christ. Disciplines like simplicity, silence, solitude, and prayer.